Ninety-nine percent of the Earth’s atmosphere is made up of two gases: (78%) nitrogen (N2) and (21%) oxygen (O2). Neither is considered an IR-absorbing/re-emitting greenhouse gas (GHG) like (0.041%) carbon dioxide (CO2) or (0.00018%) methane (CH4). Utilizing real-world Raman spectrometer data, an independent researcher from Sweden has found both N2 and O2 do indeed absorb radiation, or function as GHGs. If true, the CO2-is-a-special-heat-trapping-gas conceptualization effectively collapses. 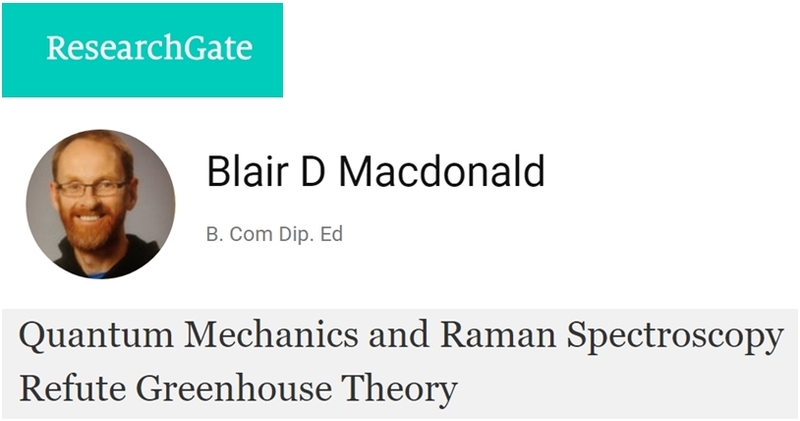 A new paper entitled “Quantum Mechanics and Raman Spectroscopy Refute Greenhouse Theory” has recently been made available online. Written by Blair D Macdonald, an independent researcher specializing in fractral geometry and quantum mechanics, the analysis utilizes real-world IR spectral measurements from a Raman spectrometer (laser). Concisely, Macdonald has determined that CO2 is no more “special” a gas absorber and re-emmitter of radiation than nitrogen or oxygen, even though the latter are not considered greenhouse gases. What follows is but a tiny snapshot of some key points from this comprehensively-sourced paper. Note: It would be advisable that interested readers – especially those who are rightly skeptical of iconoclastic analyses like these – should read the text in some detail before commenting. Turning the spotlight on papers that question conventional wisdom is primarily intended to elicit open-minded discussion. It is not intended to convey we have arrived at a definitive conclusion about the authenticities of the CO2 greenhouse effect. Greenhouse theory’s premise, nitrogen and oxygen are not greenhouse gases as they do not emit and absorb infrared radiation, presents a paradox; it contradicts both quantum mechanics and thermodynamics – where all matter above absolute 0° Kelvin radiates IR photons. The major atmospheric constituents, nitrogen (N2), oxygen (O2), and argon (Ar), are not greenhouse gases because molecules containing two atoms of the same element such as N2 and O2 have no net change in the distribution of their electrical charges when they vibrate, and monatomic gases such as Ar do not have vibrational modes. There is no contradiction. You posted another junk science paper by a “skeptic” with – presumably – no peer review at all. Why? Because he talks like you do? Do you think articles like this one here really strengthen your skeptical viewpoint? Ah yes Wikipedia as a go to science source. Not understanding what I was getting at says a lot about you too. Unfortunately I forgot the closing blockqoute tag above, but it wasn’t about „science from Wikipedia“. Although, like you, I happen to think that this particular “paper” is probably a load of rubbish, I still think that NTZ is performing a useful function in bringing it to our attention. We certainly need to have something to counteract the over politicised and one sided stories promulgated by the IPCC and the BBC. There are many potential weaknesses in the AGW orthodoxy as it currently stands. These need to be discussed. Argon has no vibrational modes but it can clearly take up energy in waveform as “heat” which in this case means more molecular movement in a closed containment increasing pressure based on the ideal gas law. It’s just nonsense that Argon absorbs nothing. Heating something and and absorbing and emitting IR at a certain wavelength are two different pairs of shoes. I just wonder if focus on IR, H2O and CO2 is the right approach calculating the overall absorbed energy balance. There have to be effects of the other wavelengths and interactions of all the other molecules in the atmosphere and IR is maybe just finally converted in kinetic energy without further waves emitted generating the “IR holes” in the spectrum at surface. That does not imply the other molecules do not contribute to conversion of photon energy in kinetic energy/”heat”. Even if there contribution is relative minuscule on a single molecule level their abundance could add up to be pretty relevant. Well this kind of changes things, if confirmed. Can’t wait for others familiar with the field and technology to either confirm or refute this paper. I’m out of my depth on this. I thought they were some kind of Japanese noodle. Yes, I’m in need of getting up to speed, as well. Perhaps this will be a good place to start? I’ll listen while having my snack (all of a sudden hungry for some reason). Yonason, thanks for the link. Macdonald has a video that explains his analysis clearly. It seems to me that Macdonald didn’t go into even superficial depth researching Raman spectroscopy and how to interpret the data. Here are some short videos on the topic. Another e.g., of where he appears to take wrong assumptions for facts. “… It’s well understood that infrared radiation radiates and heats the water…” – B. M.
No, Blair, IR radiation barely penetrates the top few millimeters or so of a body of water. See here. I hate to be too critical, because I don’t want to feed the trolls, but it is important to see that he makes mistakes that significantly impact his conclusions. IMPORTANT – rephrasing a comment I made elsewhere, just because Macdonald is wrong about his theory, doesn’t make the warmists correct about theirs. At least he, not having any training in science, has an excuse. They, on the other hand, do not. I like it! I was lined up to do a PhD on “A study of the bonding of hydrogen on silica using laser raman spectroscopy” way back in the sixties but luckily I was offered a real job by a company I had worked for as an undergraduate. I did however spend a few weeks desperately finding out about laser raman and if my remaining brain cells are working properly I agree with the author. It is complimentary to IR and involves an energy shift by interaction between EM energy and the molecular bond vibrations. I’d like to hear from people knowledgeable in this field. As a lay person with some Batchelor level science I’ve always wondered why the greenhouse effect came from such a narrow band of gases in the atmosphere. If what this fellow writes stands up to scrutiny then the whole warming scare is without foundation. Not entirely without foundation. But we may find that we are subject to yet more stupid demands, eg to remove all the oxygen from the atmosphere. If we remove too much of the CO2 we won’t have to remove the O2. It’ll disappear all by itself, once the plants starve and die. I think it’s important to note that even when it’s shown where Macdonald is wrong, that still won’t vindicate the “warming scare.” The latter will still be wrong. I’m sorry, but this is not correct. It is true that almost all gases are GHGs. However, most gases are only able to absorb/radiate in a very narrow frequency band. As a result, they make no practical difference in the atmosphere. Next, in his table, he objects to the claim that O2 and N2 are NOT GHGs … kinda true, as any decent text will show. While they can do so in certain circumstances, in general they do not absorb IR. And ozone (O3) is a GHG. Next, the author is correct that the “noble gases” (helium, neon, argon, zenon) are not GHGs. Not true. That is HIS premise, not GHG’s premise. As pointed out above, as everyone (except this good fellow) knows, N2 and O2 are indeed GHGs, just very weak ones. And it has NEVER been true that “all matter above absolute 0° Kelvin radiates IR photons.” While this is widely believed by non-scientists, actual scientists know that the noble gases neither absorb nor radiate IR photons, and in general, symmetrical dipole molecules like N2 and O2 do not absorb or emit IR. I am not really sure if you understand the point of the paper. His claim is that the IR absorption and emission of N2 and O2 is unnoticed by conventional IR measurement and only taken up using Raman spectrometry. Therefore, your claim “in general, symmetrical dipole molecules like N2 and O2 do not absorb or emit IR.” is an incomplete observation based on the method used. That would not be the first time in science history that a measurement method determines and biased the outcome. Just time will tell if that holds true. I did some work with Raman spectrometry in the past and although I do not know if his measurements were done correctly and the interpretation is solid, I can at least confirm that Raman spectrometry works in the way he describes. His claim is that the IR absorption and emission of N2 and O2 is unnoticed by conventional IR measurement and only taken up using Raman spectrometry. Yes. This distinction (between traditional vs. Raman spectrometry measurement) is clearly spelled out in the paper. 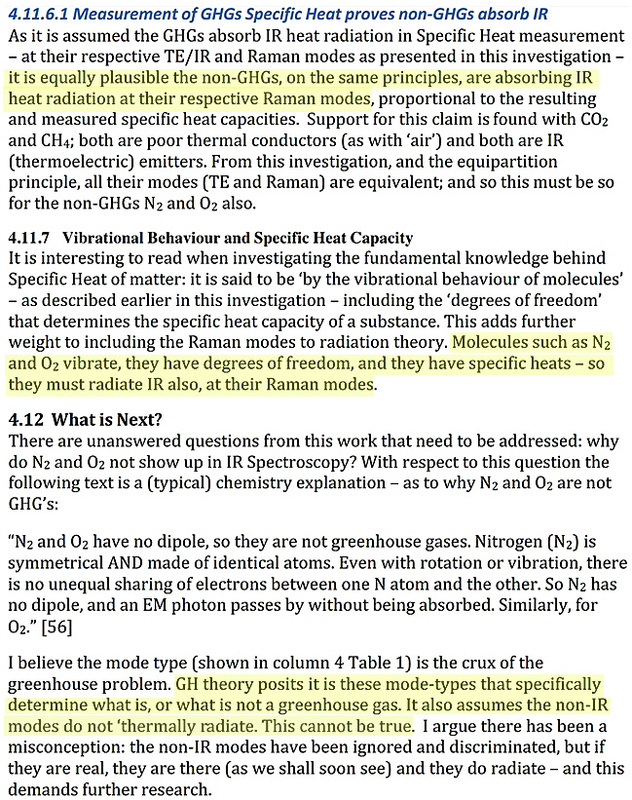 Macdonald pointed out that N2 and O2 function as GHGs in their Raman modes per the measurements, and TE/IR and Raman modes are “equivalent”. The further implication of MacDonald’s work would be – as far as I understand – that Zeller&Nikolov’s theory about adiabatic heating of the atmosphere could hold true. Cause when most gases absorb considerable amounts of IR, as claimed but MacDonald, then that would be the prerequisite for Zeller&Nikolov’s claim that the composition of the atmosphere is negligible for their described adiabatic Atmospheric Thermal Enhancement (ATE). In general, if MacDonald’s claim holds true, it would be the missing theoretical and empirical piece of Zeller&Nikolov’s ATE paradigm. Atmospheric adiabatic heating is a well known phenomenon being responsible for example the temperature rise of Foehn winds. I just wonder why this should be an exemption rather than an universal mechanism especially when the ideal gas law tells us exactly that correlation. The issue is the paper is like a layman presentation trying to pretend they understand nuclear physics. That is funny: Raman spectrometry is used to calculate the temperature of water vapor through its Raman mode yet these modes are not considered contributing to the net energy absorption/transfer in the atmosphere…?! I assume you are talking about something in Climate Science models or such which I have no idea. As you notice the actual transfers are measured and calibrated but the background is it is done not for climate science .. look carefully can you guess what it is done for. The Raman modes seem not to be used in climate modeling when it comes to IR absorption but Raman spectrometry is used for assessing temperature measurements of water vapor in the atmosphere in different altitudes. How can a Raman mode consist information about the energy of a molecule if the mode does not absorb energy and contributes to the whole energy content of the molecule? I just wonder. The quantum mechanics behind this might somebody else investigate. Never say never (where quantum is involved). It does not appear that the author undertook any real-world spectral measurements. It is a rehash of information from multiple sources, like a spectrometry of car exhaust gases. I don’t intend to spend more time on it. Conclusion: We have been lied to by Ignorant science hacks such as Al Gore and the UN’s IPCC. “Anthropogenic Climate Change” is a fraud. Hopefully, this paper will be widely circulated and understood and will break the back of “Climate Change.” No more windmills or solar panels. No mention of water vapour??? Offhand, I’d say that seems like it’s consistent with the results of these experiments. Even if CO2 had an influence it has to be added to water vapour ie 4000 ppm water plus 400 ppm of CO2 as the overlap is is almost complete in the LWIR spectra. so moving from 4000ppm plus 280 to 4000 plus 400 is minuscule in the scheme of things. then take the fact that water vapour is not evenly mixed over the surface of the globe which means you have 400 pmm of CO2 plus minor water vapour ppm say over deserts. next we have these minor things called thunderstorms which is like leaving the friggen roof off your greenhouse as heat is transported in rather large quantities right up high in the atmosphere away from the ground. so not only do we not have a “green house” with a glass enclosure, we have one with the doors and windows open as well. There is a common misunderstanding of the greenhouse effect in terms of CO2. It is widely accepted, even by AGW proponents, that due to overlap with H2O and not enough radiation from earth rising CO2 concentration has nearly no effect in the lower troposphere. Its effect solely comes from lifting the effective emission height. With the rise of that height the radiation to space takes place at a lower temperature which then means less energy loss to space. That‘s it. Schmanck and Almendinger and many other skeptics thus focus on the wrong end of the story whereas they are right to criticize the nonsense about back radiation. There is not more of it because it immediately gets absorbed by the many useless CO2 molecules. This paper here is probably just reporting well known effects that play no significant role in the whole budget calculation except in one relation. And that is the effective emission height which would be affected by the ability of N2 & O2 to radiate in Raman spectra. This could theoretically really be a show stopper to AGW theory if true. Simple measurements should show this. Hard to believe that nobody noticed that before. Paul, Thank you. Now it begins to fall into place. Is the lack of the “hot spot” and the fact that the near surface temperature is rising faster than the upper troposphere not already an indication that heat is absorbed by additional mechanisms than the GHG theory suggests? Surface warming and stratospheric cooling is exactly what one would expect the increasing GHE does. I was talking about the middle to upper troposphere. The climate models predict a warming of the middle to upper troposphere at the tropical latitudes which exacerbates the warming of the lower troposphere. This is still to be found. Instead, the artic is warming. That last sentence makes me smile as well. Does the author believe convection just continues endlessly towards space? There are clear boundaries for convection. It is not a glass roof though …arguing that the GHE is not real because there is no glass roof is ridiculous. “the Stefan-Boltzmann relation is of central importance in atmosphere physics”. Meaning, we approximate the atmosphere as a black body. No wonder climatology is rich in speculation. This is interesting, but not really relevant to the UN IPCC scary thing about redistributing the wealth of the haves to the have-nots. There has been no claim that humans have been adding tons (tonnes) of N2 and/or O2 to the atmosphere. Thus, there are no reasons to claim the “haves” have done anything to harm the “have-nots” — and thus no taxes, fees, reparations or the like to argue about. That is also, more or less, why we don’t hear much about water vapor as a GHG. What’s the phrase? No harm, no foul. Other than that, I mostly agree with Willis E., above. His main argument is challenging a few key points of the widely-accepted GHG Theory. It doesn’t “refute” the theory rather than argue for a re-assessment of the numerical assumptions. Even if the relative effect of N2 and O2 were minuscule in comparison to “classic” GHGs, their total effect could be significantly larger due to their overwhelmingly greater presence. 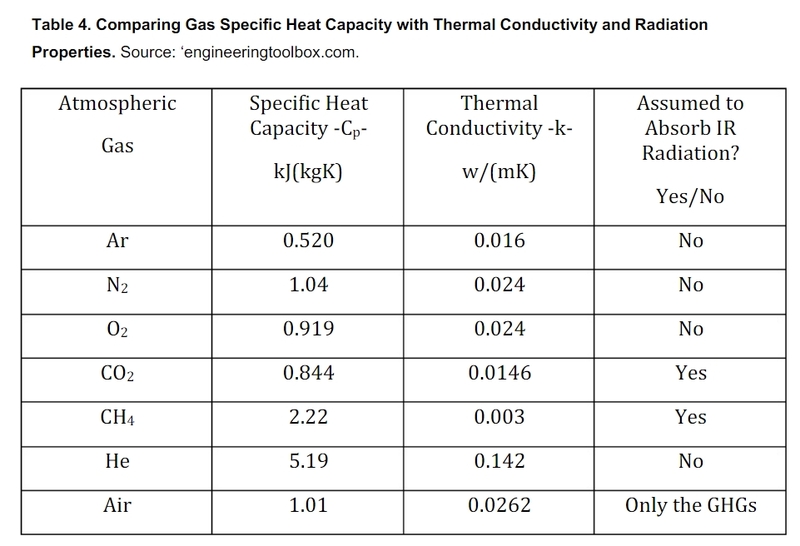 IF N2 and O2 are in fact absorbing and re-radiating energy, similarly to CO2, H2O and others, then the numerical calculations / estimates from the GHG (and the enhanced GHG theory) would need to be revisited. So if some atmospheric warming over the past few decades has been attributed (partially of completely) to increased human GHG emissions, primarily CO2, but may in fact be due to something else, then it’s back to the drawing board. Begs the “cloud question” even more than before. It would be naïve to reject the author’s inputs outright. But it is no less naïve to assume that late 20th Century warming was due mainly (or entirely) to increased human CO2 emissions. Any comments from the paper’s reviewers? BTW, I didn’t like the various typos in the paper: §4.4 ‘Error’; multiple references to ‘O2′ using ’02’ instead (the digit vs. the letter). Even if the relative effect of N2 and O2 were minuscule in comparison to “classic” GHGs, their total effect could be significantly larger due to their overwhelmingly greater presence. Yes, considering there seems to be less “concern” about methane than CO2 – presumably due to its trace presence in the atmosphere (1.8 ppm) relative to CO2 (410 ppm)- one would think that even if N2 and O2 are “very weak” GHGs, their relatively greater presence (999,100 ppm) compared to CO2 and CH4 combined (412 ppm) would mean that even a “very weak” effect for these gases should not be entirely negligible, or not worth counting at all (which is the current accounting). But, then again, we don’t add N2 or O2 to the atmosphere with our air conditioners and pickup trucks, which probably has something to do with why there is a tendency not to “count” these gases as climate factors. I obviously agree. Questioning the conventional wisdom is the heart of skepticism, even science. Yes, but if the current assumptions about ‘attribution’ [due to increased human-caused CO2 emissions] are off by a factor of two or more, then the argument for curbing CO2 becomes proportionally weaker. I don’t believe the author’s point is that N2 or O2 [or other common natural naturally-occuring gases] are the ‘culprits’, but rather that the assumptions about the relative importance [of CO2, CH4 and of course H2O] may require being revisited. There is no review. It’s self published by an economics blogger, isn’t it? Applying an itsy tiny bit of common sense should augment this naive skepticism of yours then. 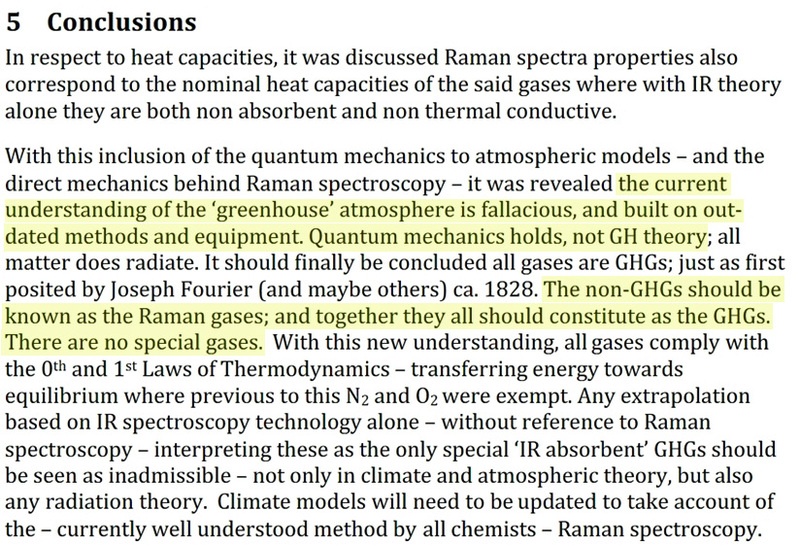 Considering the implications of real-world Raman spectrometer measured data that show N2 and O2 both function as GHGs is not about applying “common sense”. Either the measured data show these results or they don’t. Do you have observational evidence that show the Raman spectrometer data indicating N2 and O2 absorb and emit radiation is wrong? Of course you don’t. That’s why you reply with your appeals to authority and ad hominem attacks (the latter have been deleted, as have your whining protestations that you’re not allowed to insult people as you please). Provide a cogent argument that the spectrometer results identified in the paper are wrong. That would be substantive. Do you have observational evidence that show the Raman spectrometer data indicating N2 and O2 absorb and emit radiation is wrong? Of course you don’t. That author doesn’t know how CO2 lasers work, why should you trust that he knows anything about the rest of what he gathered together (no actual measurements of his own)? It’s junk science and you are falling for it, because it sounds so nice if it were true. Others in the comments made clear what the status of that paper is. You are being naive when you believe there is something to this paper, sorry. Why should one provide arguments against something that is no argument? What is there to counter exactly? Mabye you can explain it to me/us? As expected, you didn’t answer the question. Perhaps you think that saying again and again that it’s “junk science” is substantive and therefore persuasive? It is claimed that the Raman spectrometer data show that N2 and O2 absorb and emit radiation. If this statement is false, provide the evidence that it is false. If you could do that, yes, that would be substantive. I highly doubt that you can do that, though. Saying “it’s junk science and you are falling for it” is not substantive. As expected, you didn’t answer the question. When have you last answered a question I asked you and not deleted or ignored it? It is claimed that the Raman spectrometer data show that N2 and O2 absorb and emit radiation. As others have written and I surely have in the past, everything emits and absorbs radiation. Assuming that this means that everything is a GHG is the claim that I have issues with and that is clearly nonsense. GHGs react to radiation in a very specific way. That’s why you can exploit that behaviour to measure their concentration in ordinary air. That’s why you can’t see a candle through a cylinder filled with CO2 with a thermal camera (simple experiment). The whole claim is not substantive. Now what? I have been wondering for quite some time why the basic physics of CO2 receives so little attention by skeptics and sense that there is not much secure understanding of it among all parties disputing the catastrophic anthropogenic global warming hypothesis (CAGW-H). Those who address the basics – like e.g. CO2IsLife – do not seem to be taken up much by the rest of the skeptical community. One would suspect that if CO2 is physically incapable of achieving the peril ascribed to it by CAGW-H, skeptics would make this fact the center of their argument – or criticise such a theory if it were wrong. Instead, this fundamental issue is being rather avoided, I feel. If my observation is correct, why should this be so? I commend the skeptics for trying to ensure a truly scientific treatment of the issue and succeeding especially in pointing out methodological errors and empirical evidence contradicting CAGW-H. They deny the hypothesis to the best of their ability – which is the scientific way, putting obstacles in the way of the alarmists’ faith-based stampede. I hope, in addition to these efforts, henceforth more attention will be directed to the physics of CO2. I look forward to the day when someone will be able to explain to me, a layperson, what contributions we can expect CO2 to make to climate and whether it is physically capable of exerting a significant impact on temperatures in the manner proposed by CAGW-H.
One would suspect that if CO2 is physically incapable of achieving the peril ascribed to it by CAGW-H, skeptics would make this fact the center of their argument – or criticise such a theory if it were wrong. There is a lot of “peer-pressure” to at least agree to the “basics” of greenhouse theory (that CO2 is, at least, an influential climate variable) in the skeptic community (i.e., at WattsUpWithThat) so as to avoid being characterized as “nutty” or “delusional” and worse. All this serves to do is squelch debate and open discussion, which is antithetical to what it means to be skeptical. And yet it is also considered scientifically “accepted” that when the CO2 concentration doubles from 280 ppm to 560 ppm, the net temperature difference from the change in CO2 concentration alone is just 1.2 K. This just doesn’t pass the smell test. The smell test? Or could it be that you don’t understand exponential functions or in this case logarithmic functions? 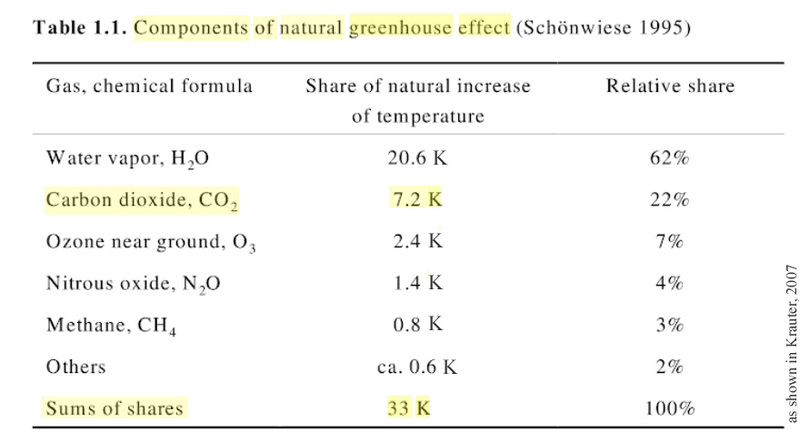 The 33 K greenhouse effect is admittedly a “thought experiment“. The 1.2 K temperature change with doubled CO2 is a modeled result. So neither one are rooted in real-world observational evidence. Nope. The effect of more CO2 on radiative heat transfer was measured. There are numerous devices that work based on that principle. Don’t act like this is all hypothetical when it is just your lack of understanding (thus “the smell test”). Feels funny, therefore you doubt that stuff works like others say it would. Very unscientific, Kenneth. The effect of more CO2 on radiative heat transfer was measured. There are numerous devices that work based on that principle. A “principle”, yes. Theoretical. Hypothetical. The 33 K greenhouse effect is a thought experiment. Atmospheric scientists Dr. Gerhard Kramm, Dr. Ralph Dlugi, and Dr. Nicole Mölders have just published a paper in the journal Natural Science that exposes the physical and observational shortcomings of the widely-accepted 288 K – 255 K = 33 K greenhouse effect equation. They conclude that this “though experiment” is “based on physically irrelevant assumptions and its results considerably disagree with observations“. Feels funny, therefore you doubt that stuff works like others say it would. No, didn’t write that. I doubt because I’m a skeptic of hypothetical thought experiments that do not appear to be consistent with observations. A “principle”, yes. Theoretical. Hypothetical. The 33 K greenhouse effect is a thought experiment. They conclude that this “though experiment” is “based on physically irrelevant assumptions and its results considerably disagree with observations“. Using the Moon to show that the actual effect is larger than 33K? Who would have thought that someone would ever find out this “secret”? The 33K “thought experiment” assumes a lot and is a simplification, Kenneth. In reality Earth wouldn’t be just 33K cooler without an atmosphere that contains GHG. That is pretty common knowledge in climate science communities from what I’ve read … but then again you guys also try to argue against the GHE because there is no glass roof on top of the atmosphere. Isn’t this what you wrote? You don’t understand how a doubling from 280 to 560 can cause so little change when the difference between 0 to 280 ppm is responsible for such a large temperature difference. This is what you call “not passing the smell test”. Do you understand how logarithms work? Should I list other mechanisms that work this way? Have you ever wondered why the loudness of sound is measured on a logarithmic scale? You don’t understand how a doubling from 280 to 560 can cause so little change when the difference between 0 to 280 ppm is responsible for such a large temperature difference. The estimation that the CO2 concentration causes 7.2 K of warmth at 280 ppm is a model-based thought experiment that people like you believe in. I understand that people like you also believe that doubling CO2 to 560 ppm and then to 1,120 ppm and then to 2,240 ppm and so on increases the forcing by 3.7 W m-2 each time, which is interpreted as a 1.16 K temperature increase for each doubling per modeling because the warming effect of CO2 increasingly decreases as it gets larger. This is why it is claimed that increasing the CO2 concentration by a factor of 8 would only increase temperatures by less than 2 K.
How could it get colder than on the slowly rotating Moon? Do they assume Earth’s albedo changes by this much without an atmosphere? Perhaps you should read their paper that explains this all for you. Their papers are rooted in NASA data. Kenneth, that is not a belief. The physical properties of CO2 are known. which is interpreted as a 1.16 K temperature increase for each doubling per modeling because the warming effect of CO2 increasingly decreases as it gets larger. This is why it is claimed that increasing the CO2 concentration by a factor of 8 would only increase temperatures by less than 2 K.
Huh? You math seems off or you just conflated two claims with each other … which is it? So then why is it that when CO2 concentrations were 260 ppm, 20 ppm lower than 280 ppm, surface temperatures were about 4-6 degrees C warmer than now, with 410 ppm? That’s not consistent with the “known” physical properties of CO2. The contradictory results of the 1974 version of the “known physical properties of CO2” were reported together with the 1980s-present “known physical properties of CO2”. So which of these “known physical properties of CO2” is right and which one is wrong? The 1.2°C is a modeled result. Models are not “known physical properties”. They’re educated guesses of what we think might possibly maybe perhaps be true. That is consistent with skeptical thinking. This question highlights that you believe that climate science says CO2 is the only thing that determines temperature. Why else would you ask? Don’t put known into quotation marks as if there were a chance that what we have measured about CO2 is somehow wrong. You can get those properties in a laboratory, you don’t need to actually double the CO2 concentration in the atmosphere. you believe that climate science says CO2 is the only thing that determines temperature. No, I don’t. Climate science says that solar and albedo (volcanic, cloud cover) forcing play a significant role in determining surface temperature. Don’t put known into quotation marks as if there were a chance that what we have measured about CO2 is somehow wrong. OK, so then which one of these “known” measurements (i.e., modeled results) is the correct one, since they contradict one another (8X CO2 = <2 K vs. 2X CO2 = 1.2 K)? you don’t need to actually double the CO2 concentration in the atmosphere. Right, because who needs real-world observations when we have models that tell us what is “known”? This property of CO2 is derived from measurements. And yes, models use this as well. Then why ask me why it was warmer with lower CO2 concentrations? You make no sense. Kenneth, you only seem to require those real-world observations in these special climate related cases. This leads to nowhere as so many of our conversations. You are too stubborn to ever realize how many of your claims are pure imagination and how one-sided your skepticism is. Then why ask me why it was warmer with lower CO2 concentrations? And because cloud cover changes explain the temperature changes of the last several decades, which means that CO2 concentration is not the primary determinant of climate now, just as it wasn’t for the last 10,000 years. In other words, the climate models contravene the evidence, leaving us with highly unsettled and uncertain “science” with regard to the CO2 GHE. We weren’t talking about temperatures, but forcings! So you believe the forcing is the same for 8XCO2 and 2XCO2 such that both yield temperature changes less than 2 K? How ironic coming from someone so entrenched in his belief in the “truth” of climate models. I don’t „believe“ in a model that says only CO2 causes temperature changes, Kenneth. There is no contradiction, there is just a deep misunderstanding of fundamental climate mechanisms on your side. Clouds don’t explain the climate change of the past decades. Stop fantasizing! And how should human CO2 be able to influence climate in the past 10000 years when human emissions were negligible? You are being weird. Why should the forcing for 8 times CO2 be the same as for 2 times CO2? I belief in science Kenneth. The ironic part here is that you don’t believe in climate science, yet try to contradict it by quoting climate science papers that you feel agree more with your worldview. I wonder how many years you can continue to stick to this routine. Do you expect that you guys eventually find that holy grail that undos all that is known about the climate and makes intelligent people believe together with you that pressure is setting the surface temperature at the end? Clouds don’t explain the climate change of the past decades. That’s odd because science/observation says the Earth’s radiation budget changes are caused by tropical mean cloudiness. And science says that changes in the Greenland ice sheet are “driven” by cloud cover changes. In contrast, the changes in the Greenland ice sheet attributed to anthropogenic forcing are too small to even be detectable. Besides, as you know, CO2’s radiative forcing values are estimated to be a ridiculously weak 1 W m-2 for the poles, which is negligible compared to both the LW and SW effects of cloud cover (~30 W m-2). I’m a little curious where this “fantasizing” comes in considering these are peer-reviewed scientific papers I have referenced. And they’re just the tiny tip of the iceberg. There are 100s more like this. It shouldn’t. That’s the contradiction I was pointing out between the 1973 “known” effect for CO2 forcing of temperature vs. the 1980s and onward “known” effect for CO2 forcing of temperature. you don’t believe in climate science, yet try to contradict it by quoting climate science papers that you feel agree more with your worldview. How terrible of me. I actually post scientific papers published in Science and Nature to support what I’ve written. And what do you do in contrast? I wonder how many years you can continue to stick to this routine. How many more years will you be here, trying desperately to have a persuasive impact? What’s odd are the examples you picked. Another odd one … comparing a relative forcing to a total forcing again? The quotes that follow highlight your level of understanding pretty well. Somehow you try to argue that whatever happenes over Greenland is responsible for the temperature of Greenland. Completely ignoring that it’s a global climate system. Do you really think the Arctic is warming by itself and not largely by heat being transported there from elsewhere? I am sure you are capable of interpreting them in your unique way as well. That’s the fantasy Kenneth, not the papers themselves. This gets increasingly odd as well. Somehow you are trying to see that 8x CO2 article as having the same weight as any other paper on the topic or – you know – the actual devices working on that principle / knowledge. And somehow a temperature change became equal to forcing in your mind. I tell you again and again that your interpretions are fantasy. That you show a deep lack of understanding. That you can’t be taken seriously when you post stuff like in the article above as “if true, then”. The first shows how the data do not reflect a central part of the models. The second builds on Salby’s and Harde’s work to show human emissions only about 4% of the atmospheric content and are not materially increasing that percentage. It further demonstrates the failure of the IPCC Bern of atmospheric CO2 evolution to replicate known data. I pretty sure I replied to one of your comments on WUWT re the CRES satellite picture of the natural release in the NH of CO2 in May, completely overwhelms all natural sinks and cannot recover in time for the next cycle so CO2 increases. During winter there is no human CO2 hot spots identifiable over any major population centre at all. 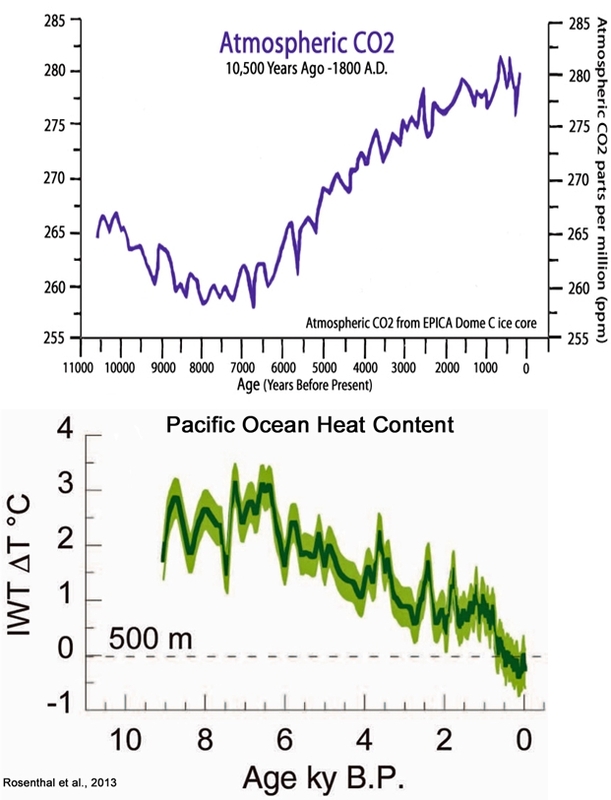 CO2 grows in part because temp increases promote tree and undergrowth growth, which enhances the May increase add that to ocean outgassing and there you have increases in CO2 lagging temperature. DMA, thanks for the links. Glad to see Dr. Ed Berry’s paper finally got published after a concerted effort by alarmists to censor it. I posted in the past a synopsis of analyses by Humlum, Harde and Berry that counter the IPCC consensis science regarding attribution of rising CO2. Ron, I remember a Japanese study which looked into the whereabouts of the increased CO2– and surprise, surprise– it was not in the industrial northern hemisphere. No, twas in the southern hemisphere. Rotting vegetation, marshlands, etc I guess. Sorry I couldn’t find the link. sorry missed this earlier. my understanding is that it is the northern hemisphere but not over man made cities but over the boreal forests. And find that it is out of balance where the humans are. Or is this another primary water / contrail conspiracy? Like the rain forest or Canada? Of course it’s the other side that does cherry picking. You know, like the South Pacific Ocean, Western Sahara Dessert, Saudi Arabia and the Middle East, Indian Ocean, Eastern Pacific Ocean and Western USA, Southern S. America, etc., etc. I.e., everywhere were humans either are not or aren’t industrialized. Surprise, surprise, no we can’t see it – SebH is wrong yet again. And it’s not as if he couldn’t know it. I and others have posted about that on this blog, and others have elsewhere (which is where I learned it). So, is it deliberate deception on SebH’s part, or is he just too stupid to remember? Either way, he’s just wrong, as usual. Ehm Yonason, have you even read that Euan Mearns post that Scott linked to? It mentions the forest being out of equilibrium, e.g. being out of balance. I was referring to that. These childish „he is wrong“ strawman rebuttals of yours need to stop. I am not the one deceiving others here. Look amongst your peers. Georg, an example of what you say. This recent study analyzed in detail the last 40 years of satellite measurements of the temperature profile in the troposphere and stratosphere. They conclude that any effect from rising CO2 can not be discerned. • The global warming during 1978–2018 was not more enhanced at high latitudes near the surface. • The intrinsic properties of the lower stratospheric temperature are not related to those in the troposphere. • The results obtained do not reveal the global warming occurrence. Good find, Ron Clutz. Once again, the conventional wisdom of an enhanced GHG-caused warming of the planet is not supported by the observations. Perhaps a re-assessment of the greenhouse theory is in order. Ron, Thanks for the very interesting paper. Sometimes I wonder how do these guys pluck up the courage to write such heretical stuff? Does this mean that what is measured in Mauna Loa is the total IR absorption, calibrated in ppm CO2? I believe the Mauna Loa folks are measuring molecules, not IR. Read up on how CO2 in the atmosphere gets measured. You radiate a tube with IR at a certain wavelength and a detector on the other side tells you how much got through. It exploits the GHE of CO2. Not really. What you mean by the GHE of CO2 is the ability to absorb and emit IR. Whereas this ability is condition for the GHE of CO2 it has not much to do with it. Nearly all of the GHE of CO2 comes from lifting the effective emission height of the atmosphere to a slighly higher (colder) layer with rising CO2 concentrations. That is the theoretical and quite sound hypothesis (without any feedbacks). Whether this happens exactly so in the real world is the question. What does the lapse rate do, how does convection or evaporation reacton that impulse? Nobody really knows. The sparse measured values give room for all possible interpretations. Far away from being settled no matter what models say and how they match temperature measurements. Whether this happens exactly so in the real world is the question. Question. does only CO2 raise the emission height of the atmosphere, or does water vapour also play a role? of course water always plays the dominant role but in terms of the GHE of CO2 without feedbacks water is assumed to be constant. The purpose is to determine what happens if you double CO2 and leave evrything else unchanged. Out comes a higher effective emission layer radiating less energy to space and thus heating our poor and dying planet from 288 K to catastrophic 289.2 K.
That‘s the theory. In reality the warming world will see more evaporation, more water in the atmosphere, sometimes more convection, sometimes less. The question is where will the water accumulate? In high clouds with cooling or in low clouds with warming during the night and cooling at day? Or where will that happen? Only in dry areas with no water overlap? Will wet areas with high overlap be affected at all? What happens to the lapse rate? Will it steepen as radiosondes are indicating or flattening as satellite data are indicating? And what about the interaction of all those effects with natural cooling/ warming by ocean oscillations, with changing ice albedos or with the effect of the greeening earth? Nobody in this world can ever calculate that without error bars higher than Empire State Building. That is ridiculous. And the best thing: Even if somebody was able to do that calculation there would be no solution for the problem except the whole world going full nuclear. Fine for me, but obviously not for the AGW believers. This is the clearest sign to identify the whole thing as a pure ideology/religion. Clive Best has something on that here. I’ve also heard Lindzen speak about it, but can’t remember which video it was in. It’s not a big effect, and nothing to panic about. If it was, the damage would have already been done due to much higher [CO2] in the past. I think the issue I am having is the statement “the water is assumed to be constant” which we know its not ie deserts and tropics. This means that the emission layer is actually at different levels all over the world. The issue then becomes what happens at these changes in emission height? does the heat escape more readily through these lower emission levels? I think the post by Okulaer covers this point well with the differences between a high and low humidity location with similar input. I think when massive statements like “assume this is constant” are made in a chaotic world, the output is bound to fall over. And the best thing: Even if somebody was able to do that calculation there would be no solution for the problem except the whole world going full nuclear. Fine for me, but obviously not for the AGW believers. This is the clearest sign to identify the whole thing as a pure ideology/religion. I’d say the clearest sign that you skeptics are not to be taken seriously is this paragraph. You are conflating AGW proponents with anti-nuclear types and completely ignore that nuclear is by far the most expensive solution to provide eletricity. Imagining that this would be the solution and – presumably – thinking that renewables would be too expensive is just ridiculous. I’d say the clearest sign that you skeptics are not to be taken seriously is this paragraph. SebastianH, you’re going to have to stop assuming that it deeply concerns skeptics that believers (like you) say that we are not to be taken seriously. We are not swayed by the appeal to authority arguments that you peddle. Nuclear today is more expensive than fossil fuels. That is true. Mostly because it was overregulated within the last decades. It was killed by exaggerated political fears. Still, nuclear is by far cheaper than wind & solar if you compare apples with apples and add a battery to every windmill or a gas power plant to a solar park in order to provide constant output. Solar will never produce enough energy to justify the invest and spent area compared to just burn a little more gas in the nevertheless existing gas power plant which then also runs at a higher efficiency rate. If it was that cheap why do we have to throw billions after billions in those technologies year after year? And that is still without forcing those parasites in the grid to come up with a technical solution to deliver constant output before getting grid admission in the first place! This requirement immediately and rightfully kills that childish dream which in fact is a nightmare for nature & landscape on top. Although this is obvious to everybody in the real world the green dreamers still promote 100% renewables. If that was achieved, Germany’s landscape would be completely destroyed and the grid completely unreliable without any potential to support growing energy demands from new technologies in the future. How serious is that? Still, nuclear is by far cheaper than wind & solar if you compare apples with apples and add a battery to every windmill or a gas power plant to a solar park in order to provide constant output. Paul, here is the thing, power demand isn’t constant. You can’t follow demand with only nuclear power stations, you’d need batteries or some kind of storage as well. If it was that cheap why do we have to throw billions after billions in those technologies year after year? “was” … it wasn’t cheap, it is cheap now and economical in many regions already. We threw money at it so this happens faster. That is not a requirement. Why would you want to force a power station to deliver constant output when nobody needs the power? What you want to have is a good mix that is able to follow demand. At a certain point storage will surely be necessary for solar and wind, but that point has yet to be reached. Although this is obvious to everybody in the real world the green dreamers still promote 100% renewables. If that was achieved, Germany’s landscape would be completely destroyed and the grid completely unreliable without any potential to support growing energy demands from new technologies in the future. How serious is that? This is BS and you know it (I hope). Are you trying to troll me? @Kenneth: you are no skeptic and I am not a believer. Stop imagining these two things. Thanks a lot for the link to Okulaer, very interesting stuff. I really enjoy reading and learning all there is on this subject. thanks to people like yourself, Kenneth, Pierre, etc etc. Its the only way the real story will be found as its not coming from inside the cult that’s for sure. There are way too many holes in their hypothesis to even make it to a theory let alone settled science and government policy. Its the only way the real story will be found as its not coming from inside the cult that’s for sure. The cult is you guys however. You are making up a story that you feel is easier to believe. No one knows why, except maybe you are somehow invested in fossil fuels or like them really much. I assure you the holes are entirely on the climate skeptic side. None of the arguments brought forward have any weight. Almost nothing is replicable. The question is not “what if we are right or wrong”. The question is why you guys are so stubbornly sticking to what is clearly wrong and only amounts to massive disinformation campaigns. It’s always the same memes that you guys post. All have been shown to be false, yet you continue as if nobody has told you. Like a cult. Ahh Seb your a bit like reading the comic or horoscope pages in a newspaper, good for a bit of a chuckle but useless for anything important. maybe not totally true you do prove the sceptic side every time you type something before being eviscerated so completely by Kenneth and the others on here. keep up the good work my man as no one does more harm to your cultist cause, than you do. Please follow this line of inquiry as Real Scientists search for “truth”. If the evidence is discovered that the whole atmosphere adsorbs and reemits IR energy carbon compounds cannot be large enough proportion of the energy equation to exert control. I am not sure if their could be maybe a general misconception about “heat” in the AGW and “greenhouse” theory with regards to IR?! IR is surely important because of its interaction with and energy transfer to H2O – and H2O is a main component of our lower atmosphere and of course biosphere – but “heat” is thermodynamically defined as molecular movement of molecules but also the swinging of atom cores around their degree of freedom. This can be induced by multiple wavelengths depending on absorbance spectrum of the given molecule and is not limited to IR. So it is maybe just a general misconception to focus on IR alone when it comes to “heat” absorbance in the atmosphere. Someone linked this junk to WUTW, if you can’t see the problem with this rubbish you shouldn’t be commenting. Raman interactions are very very minor but they are easy to detect which is why it’s used for chemical sampling etc. Ask the author how many Raman interactions occur in the atmosphere to other types, that alone should tell you if he understands anything. Maybe you should reconsider your view. Absorbance /= emission. That the Raman signature is a weak emission signal does not tell you anything about energy absorbance/transfer and heat convection. Equipartition Does not seem to be understood by most of the theorists, armchair or otherwise. Which leaves us just with the experimenters. They have also disproven AGW many times. So had Maxwell, Tyndall and Poisson. Wood, Hartmann, Allmendinger and Klein. For starters…. This paper may fill a gap known in atmospheric absorption, but papered over all the time. The uselessness of radiative emission in non-sparse atmospheres is likewise ignored by armchair experts. At least it is clear that the atmosphere is transparent to short wave solar photons but opaque in certain IR wavelengths. Were that not so the emissions height would be the surface and the surface temperature would be 255 K. I continue to believe in the spectroscopy texts. Is “transparent” the right term when 1/3 of the visible spectrum does not reach the surface? And shouldn’t there energy be transmitted in a scattering process? Transparent to transmission of shortwave. Scattering reduces transmission, of course, and there is some IR in solar radiation. Ron, is Kirchhoffs Law of thermal radiation then not true? It is true, but only under conditions of local thermal equilibrium, as for example your living room where temperatures have equilibrated throughout. The sun / earth / space system is far from lte, so Kirchoff’s law cannot be assumed. It’s only true for systems in thermodynamical equilibrium. I am not so sure Earth is one. And I also wonder now if the “missing” energy from sunlight without atmosphere minus sunlight at sea level in the visible spectrum is really just through “scattering” from N2 and O2. The earth is not in thermodynamic equilibrium. That was my point. Sorry, I wrote my answer to Neogene Geo without seeing you had already made this point. And lots more information there. Shouldn’t Mars that has an atmosphere of 95 percent CO2 be warming and be even rather hot by now? A GHG absent of nitrogen and oxygen is not behaving like it should. Purdy much explains it all. No, do you even want to know why Mars is not hot despite a 95% CO2 atmosphere? Mars’ atmosphere is about 100 times thinner – meaning there’s about 1/100ths of the atmospheric pressure – as Earth’s atmosphere. That, and the distance from the Sun, set that planet’s temperature. Similarly, Venus’ atmosphere is 92 times thicker – meaning there’s about 92 times the atmospheric pressure – as Earth’s atmosphere. That, and the distance from the Sun, set that planet’s temperature. Interestingly, on Venus, there’s a region where the atmospheric pressure drops to 45 bar. There, the temperature also drops by almost -80 degrees C relative to the rest of the planet. The CO2 stays the same, but the pressure changes. The pressure change determines the temperature change, or sets the temperature. Super interesting, Kenneth. Why do you think the CO2 stays the same? Why do you think it should be warmer at higher altitudes if there was a CO2 GHE? Why do you think it should be warmer at higher altitudes if there was a CO2 GHE? I don’t think it “should” be warmer at higher altitudes. I think it should be warmer where the atmospheric pressure is higher and lower where atmospheric pressure is lower. And that’s how it works on Venus, Mars, and Earth. The comment about the CO2 staying the same was added to point out that the atmospheric CO2 concentration is not what changes the temperature by -80 degrees C, but the drop in atmospheric pressure. Or do you have a different explanation as to why the temperature drops by -80 C in the Maxwell Montes region (Venus)? That is how it works. The lapse rate. Why would the CO2 concentration change the temperature with altitude? You are mixing up things here. One is the lapse rate and the other is a general effect that increases the overall heat content of the system. It is cooler at a higher altitude, but the temperature at that altitude is still determined by the GHE. I am sure you would agree that it would be even cooler at the top of that mountain if it would be cooler at lower altitudes. You are talking about relative temperatures and confuse them for absolute temperatures. I don’t know why you feel that this is a valid argument for the Zeller nonsener or against the GHE. Why would the CO2 concentration change the temperature with altitude? It wouldn’t. And no one is claiming it would. The CO2 concentration is not responsible for the temperature difference. The atmospheric pressure difference is. The atmospheric pressure difference is what sets the temperature of the surface. It works this way on both Mars and Venus. And Earth. It is cooler at a higher altitude, but the temperature at that altitude is still determined by the GHE. The temperature on the Maxwell Montes region on Venus is -80 C lower than the temperature on the rest of the planet because the atmospheric pressure drops to 45 bar in that region. If the difference in surface temperature fluctuates by 80 degrees C due to the atmospheric pressure difference, why do you nonetheless believe that the atmospheric pressure value is not what sets the temperature for the rest of the planet, but instead the CO2 concentration is what sets the temperature for the planet? Why does the causal factor for the 80 C difference cease to be the determinative factor for the overall 462 C temperature? You are talking about relative temperatures and confuse them for absolute temperatures. The “absolute” or overall temperature for Venus is 462 C. The reason that the regional temperature drops to 380 C is because the regional pressure drops to 45 bar. And if you agree (like you’d have to) that the pressure drop is responsible for the -80 C temperature drop, why does the overall or “absolute” pressure value for Venus itself cease to be the determinative factor in the overall planetary temperature of 462 C? The CO2 concentration is not responsible for the temperature difference. The atmospheric pressure difference is. The atmospheric pressure difference is what sets the temperature of the surface. Nope. The surface temperature is not set by the lapse rate. The gradient starts at the surface. The temperature on the Maxwell Montes region on Venus is -80 C lower than the temperature on the rest of the planet because the atmospheric pressure drops to 45 bar in that region. Relative temperature is not absolute temperature. If the difference in surface temperature fluctuates by 80 degrees C due to the atmospheric pressure difference, why do you nonetheless believe that the atmospheric pressure value is not what sets the temperature for the rest of the planet, but instead the CO2 concentration is what sets the temperature for the planet? That is not a belief and you are still mixing up a temperature gradient that has to start from somewhere with what sets the temperature. This is a ridiculous conversation. Why does the causal factor for the 80 C difference cease to be the determinative factor for the overall 462 C temperature? Because they have nothing to do with each other! If it were 200 C on the surface it would still be 80 C cooler at the same height with the same lapse rate. This gradient doesn’t set the surface temperature … it can’t! It is the result of surface heating vs. cooling at the top of the atmosphere. Nope. The surface temperature is not set by the lapse rate. The surface temperature is set by the relative atmospheric pressure value. The gradient starts at the surface. The surface has various heights. The surface is not an absolute value. On the other hand, if the atmospheric pressure of Venus was only 46 bar instead of 92 bar (as it is now), would the “absolute” temperature of Venus be different/colder than its current 462 C? If yes (and you cannot say that halving the pressure would not reduce the surface temperature), in what way is the atmospheric pressure value not setting the temperature? This gradient doesn’t set the surface temperature … it can’t! The atmospheric pressure value – 92 bar for Venus, 1 bar for Earth – is what sets the surface temperature. Venus is much warmer than Earth significantly because of its 92-times-thicker atmosphere. I’d like to counter with a question: do you think places at the surface with the same pressure should have the same temperature (assuming same latitude)? Do you think the molecules the atmosphere of Venus consists of have nothing to do with what is going on in the atmosphere and the amount of heat content that it can accumulate? See, the pressure is somewhat an indicator of how many molecules exist in the atmosphere in the gravitational field. It doesn’t set anything, it is the result of how far gravity can compress the gases. There are planets like Jupiter which still experience ongoing compression and haven’t settled yet. And this ongoing process is part of why they are warmer than expected. Nope. It’s the composition of the atmosphere together with incoming energy from the Sun that determines the heat that can accumulate and thus the surface temperature. So you think the temperature at those varying surface heights is set by some arbitrary starting point in the atmosphere from where the temperature gradient increases downwards? Really? Repeating myself, the Maxwell Montes temperature is almost 80 degrees C lower than the overall averaged temperature for the rest of the planet (380 C vs. 462 C). Why? Because the atmospheric pressure is much lower there (45 bar vs. 92 bar for the rest of the planet). The gaseous concentration values aren’t the critical reason for the temperature difference. The atmopheric pressure is. And this same principle applies for the rest of the planet: the temperature “setting” is determined by the pressure (__ bar) and the distance from the Sun. And of course the “starting point” for the atmosphere is indeed arbitrary for every planet. Unbelievable. Dodging again. OK, I’ll answer your questions. Then you answer mine. do you think places at the surface with the same pressure should have the same temperature (assuming same latitude)? Uh, well, considering there are relative and variable factors like wind, cloudiness, humidity, treecover, terrain (sand vs. prairie vs. concrete)…that affect the temperature of the surface too, no, the temperature will not always be the same with the same elevation. On the other hand, the surface temperature at one thermometer station in an open field that is 5 kilometers away from another thermometer station in an open field will likely be 90+ percent similar mostly because those other temperature-affecting factors will likely not be at great variance and because the surface elevation (the pressure) will also not be at great variance. But if the one station was located 0.5 kilometer higher than the other station, the temperature difference would be much greater than if they were at the same elevation because the pressure difference has affected the temperature difference in that case. Do you think the molecules the atmosphere of Venus consists of have nothing to do with what is going on in the atmosphere and the amount of heat content that it can accumulate? No, I don’t think the gas molecules have “nothing to do with what is going on in the atmosphere” of Venus. I assume that if Venus had water vapor molecules it would affect the temperature, for example. The extent of that effect is speculative…since Venus doesn’t have 1,000 ppm to 40,000 ppm water vapor molecules like Earth does. Now answer my question: If Mars’ atmospheric pressure value was 1 bar (like Earth’s) instead of the 0.006 bar that it is now (with 950,000 ppm CO2), would that have the effect of raising the temperature of Mars, or would Mars’ temperature stay the same? Similarly, if Venus’s atmospheric pressure value was 45 bar for the overall planet instead of the 92 bar that it is now, would the Venusian be much colder than it is now, similar to the -80 C drop recorded for Maxwell Montes? Or would Venus’s temperature stay the same because of the 960,000 ppm CO2? The top of Jupiter’s atmosphere reaches 725 C because its atmosphere is 318 times thicker/denser than Earth’s. Jupiter has no GHGs in its atmosphere. Venus’s pressure value is “only” 92 times thicker than Earth’s, but its surface temperature is 462 C. Mars’ pressure is just 0.006 bar compared to Earth’s 1 bar, and thus Mars is much colder than Earth. Noticing a pattern here? Pressure alone is not determining the temperature according to Zeller&Nikilov, it’s pressure + solar radiation/meaning distance to the sun. Correct. I’ve been writing that. the temperature “setting” is determined by the pressure (__ bar) and the distance from the Sun. The pressure-based assumptions go back much further than N&Z, though. They’ve just been much more outspoken more recently. Yes, I realize I have exposed my ignorance. It was 6 degrees Fahrenheit yesterday morning. The record high temperature is 69 degrees Fahrenheit on this date in 1939. In 1940, the record low was recorded at minus 20 degrees Fahrenheit. In 1953, the record high temp was at 69 degrees F again, and in 1927, it was -19 degrees F. Go figure again, one more time. Climate is a conundrum. Climate science is the best thing going, it don’t get no better. A good try as to how it can be and is done, nonetheless, it will be befuddling, no matter how hard you try. Since Mars has a greater radii, it has more distance in diameter, therefore, the circumference is more than the earth’s. The AU is 1.52 for Mars. 1.52 times 93 million is 141,360,000 miles. The circumference, the distance of the revolution, amounts to a pile of miles. 444,095,537.511 x 2 = 888,191,075.023 miles, according to Google’s calculator. Gonna take longer, more time for infrared radiation to reach the surface of Mars. 292,168,116.784 times two is 584,336,233.568 miles. 304 million miles more. No matter what, you’re bookin’ it. An indication of more exposure to IR radiation, has to have some effect. Including radiation filtered by the Van Allen belt, another solar radiation direct effect on the surface of Mars, gamma rays included. Farbeit from me what it can possibly be, I have no access to instruments capable of how to measure, what the measurements are. It can be done. One look at what humans have done is proof enough. When you have AI on the surface of Mars, you know you are out of the dark. Although, I have eyes. Begins there and then to the brain, whatever that is. It is evident here that very few people actually grasp field theory. There is only ONE electro-magnetic field. That field is a continuum that exists in all matter as well as a vacuum. In terms of a field it is no different to gravity. Different types of matter can respond in different ways to various disturbances (waves) in the E-M field. Some matter will not interact with the field at all. Some matter will react with certain waves in the field and absorb as well as release energy quanta or energy continuum from the field. Some matter will not absorb energy from the field but its speed of interaction is not at the speed of light. Raman spectroscopy relies on scattering. That is where matter (in this case gases) alter the speed of interaction rather than actually absorbing and releasing energy quanta. It is one hour long lecture including questions and is worth taking the time to take it all in. A question on climate models near the end is revealing. This is precisely why I personally find it so rewarding to highlight “unacceptable” papers like Macdonald’s. We would never have arrived here, approaching 100 comments later, with most of them substantive and informative, had we stuck with only the we-must-agree-the-CO2-GHE-is-truth-as-a-starting-point papers. Thank you for the link, Rick Will. I fully agree with Kenneth. Thank you very much for that link. I have watched the presentation twice now. Have to do things and miss some the first time around. Well worth watching, you do pay attention. If you haven’t, do so. Wonderfully honest, exposing the “settled science” claim for the nonsense it is. And at the very end he takes a sledge hammer to the tunable models. Sweet. I don’t feel so guilty now about not being able to explain what he tells us the experts haven’t bothered to investigate thoroughly enough to understand. I’m sorry, I’m probably wrong, but I can’t see that demonstrating that nitrogen & oxygen are greenhouse gases disproves the AGW fallacy– namely that CO2 is a cataclysmically greater greenhouse gas. “Yes, of COURSE the major components of our atmosphere retain to the surface some of the sun’s heat. It’s well-known in every child’s textbook that life on earth wd be impossible w/o our atmosphere– for this reason among others. I’m sure I’m expressing this badly, but if you cannot win by pointing out that the amt of nitrogen & oxygen dwarfs that of methane & CO2, then how can you win by pointing out that the warming by one makes the warming by the other irrelevant? The AGW hoaxers are merely arguing that there is a manmade CHANGE in CO2. Can’t see it’ll matter a whit to them if MacDonald is correct as he probably is. Did anybody here heard so far about “Collision-induced absorption and emission”? Interestingly, the majority of the absorption spectra generated by this mechanism are in the IR and microwave wavelength. As the atmosphere is a mixture of gases it would make much more sense to not collapse the individual spectra of each gas and try to re-identify these in the whole atmospheric spectrum but try to understand all possible molecule-molecule interactions. To make things really interesting: the collision-induced absorption spectrum is T and p as well as mixture dependent so its character would change with the altitude. Quantum mechanics would imply that there are way more states than the one from the GHG which can absorb IR. A thicker atmosphere would imply more collisions generating a higher chance of a state absorbing additional IR. And of course, the effect of convection in heat transfer is still not addressed. Well, I can’t add anything substantive to the conversation, but this link to Ned Nikolov, PhD shows him discussing this very question of the potential of N2 & O2 to absorb IR. A year ago. I think you should fit him into your conversation, not excluding his link to page 224 of Principles of Planetary Climate.